Of all the nonsensical rhetoric to come out of the mouths of politicians, arming teachers to thwart school shootings is so utterly misguided, it is truly baffling. Let’s start with the cost. Some school districts can’t even supply their teachers with enough paper and pencils. Suddenly they will find money in the budget to buy firearms for every teacher? 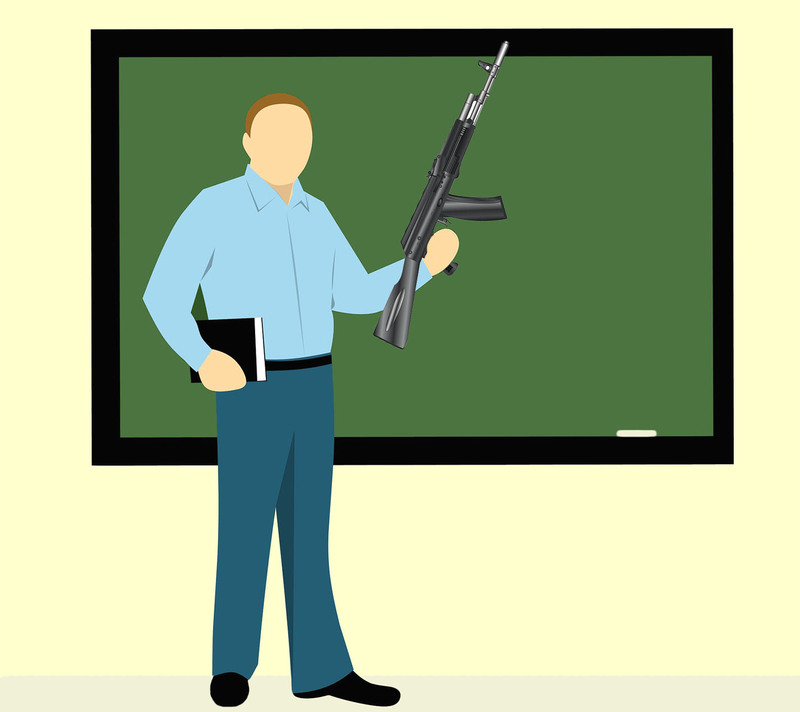 To buy the many hours of firearms training and safety training that would be necessary for every teacher in every classroom? The voices pushing this idea are the same ones who yell for lower taxes. Where exactly would the funding for this come from? Practicalities aside, consider it from the perspective of a teacher. Someone grows up wanting to be a teacher. They love children and want to devote their career to teaching kids to read and write. They put themselves through years of college and get a position at a local school. And on day one they are handed an automatic weapon and told to defend the lives of students should a gunman ever come to the school. After spending years arming themselves with knowledge to pass onto a new generation, teachers must now become psychologically prepared to take a human life in defense of students. They did not sign up for this. Teachers are commonly undervalued here in the U.S., even though teachers are the foundation of any functional society. Suggesting teachers be armed is putting them at the front lines of a war they never signed up for. Teachers go to school to learn how to teach. If they wanted to defend the lives of citizens, they would have become police officers or joined the military. It takes years of intense training to reach the technical level of expertise and to attain the sound decision-making skills required to save lives amid chaos. If teachers are to be expected to carry weapons to school, there will be a mass exodus of teachers from the profession. And when that happens, who will take their place? Lesser qualified gun-loving individuals who will teach, explicitly or implicitly, the next generation that they need guns around them, all the time, even in a supposedly safe place like school. It is a Band-Aid, not a solution, to turn schools into fortresses defended by an armed teaching staff. Arming teachers doesn’t solve the real issue of why these school shooters become school shooters in the first place. What is it about our culture, about our society, that enables this behavior to be repeated over and over again? There is no one answer, but health care is an obvious place to start. Make comprehensive health care available to every citizen and campaign to reduce the stigma of asking for help with mental illness. Improve education about warning signs and streamline the processes of reporting potential threats. Talk about prevention rather than defense. And yes, make guns less freely available. Before you go repeating the same rhetoric being tossed around in every gun debate across this country, for once, use the critical thinking skills your teachers at least tried to teach you and then decide if arming teachers is the solution to America’s school shooting problem. Your homework for the next century: Eradicate the term “school shooting” from our collective vocabulary. Agree? Disagree? We’d love to hear from you! Send a letter to the editor at kdijkstra@antonmediagroup.com.